I had the opportunity to kill two birds with one stone (in a vegan manner, of course): A birthday cake and a wedding cake test of sorts. It was Dennis’ birthday, and so of course I was going to bake him something! I sat down with about 13 cookbooks in front of me (while watching Grey’s Anatomy…two of my favorite things, baking and medical dramas). 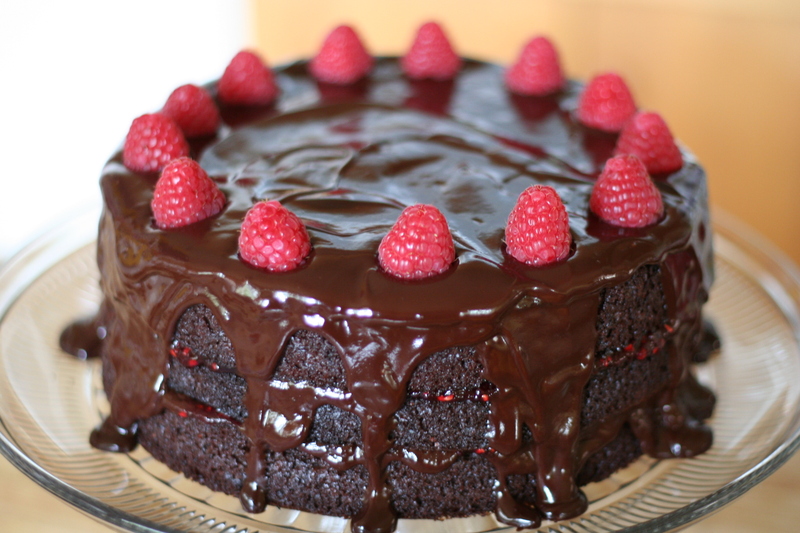 I searched high and low for a cake that would satisfy a chocolate lover. Originally I was looking for something with nuts but this cake caught my eye – and then I remembered I’m also supposed to be wedding cake testing for my friends’ wedding to be held this summer. Their first request matched up with this cake recipe perfectly. I had to choose it, and I’m so glad I did! I baked a three-layer birthday cake, and had extra batter that I baked into cupcake form for the taste-test. 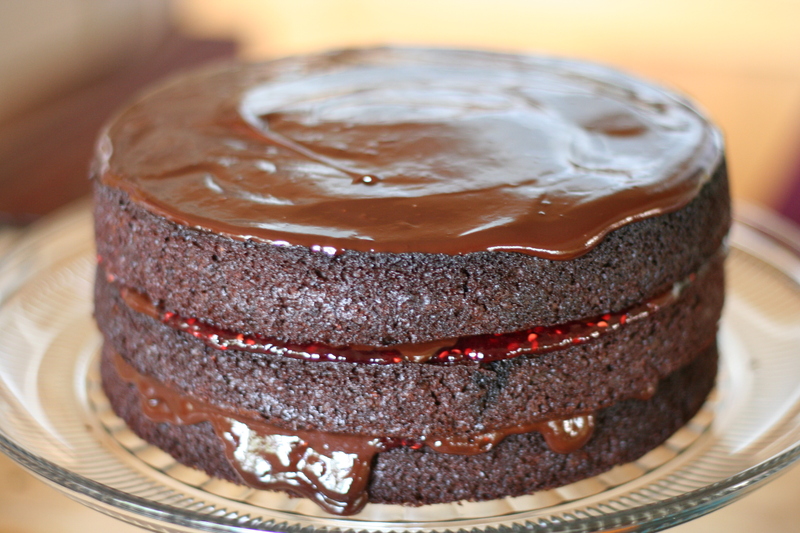 I spread raspberry jam in between the layers of the cake and then drizzled dark chocolate ganache on top of the jam, and then of course spread a thick layer of ganache over the top of the cake letting it spill down the sides. For the cupcakes, I piped raspberry jam into the center, topped the cakes with fresh raspberries, and gave my friends a container of the ganache to spread or dip their cupcakes into when they ate them – the consistency just wasn’t right to pipe on top as I had hoped it would be (however, the next day it was perfect for spreading…Just needed to be cooled completely). Preheat oven to 350 degrees F. Spray two 8-inch round springform cake pans with cooking spray. If you don’t have springform then use parchment paper rounds on the bottom of two ordinary 8-inch round cake pans to prevent sticking. Sift together the flour, cocoa powder, baking powder, baking soda, and salt. Combine the rice milk, oil, 1/2 cup of the preserves, the vanilla, and the sugar in a large bowl and mix with a hand mixer or strong fork. The jam should be mostly dissolved with the rest of the ingredients; some small clumps are okay. Add the dry ingredients to the wet in batches and mix until everything is incorporated. Divide the batter between the prepared pans and bake at 350 degrees for 40 to 45 minutes, or until a toothpick or knife comes out clean. Remove from oven and let cool in pans. 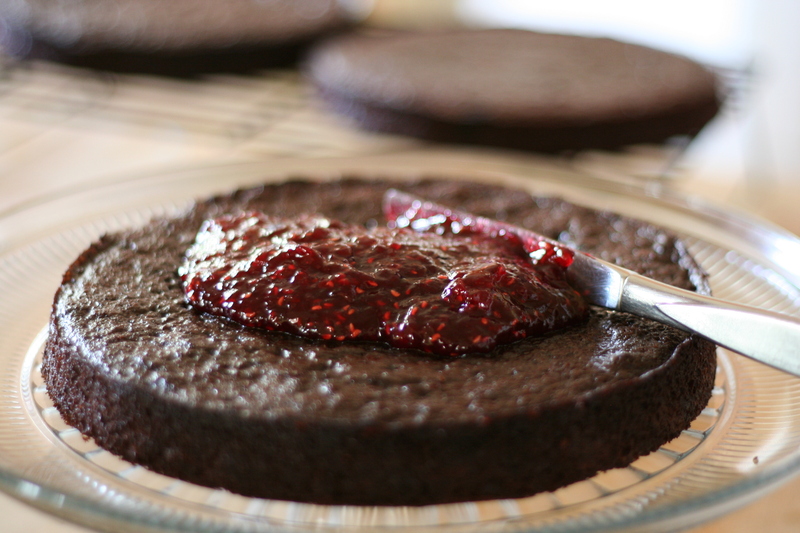 When the cakes have cooled fully, spread one layer of cake with a thin layer of the preserved raspberry preserves (give the preserves a quick mix with a strong fork to get a spreadable consistency); spread or drizzle a layer of chocolate frosting on top of the preserves. 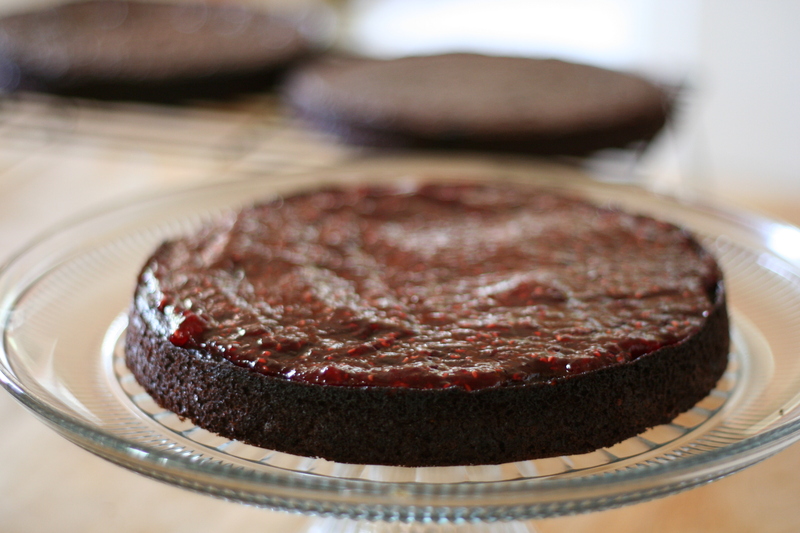 Place the other layer of cake on top and spread its top with preserves. 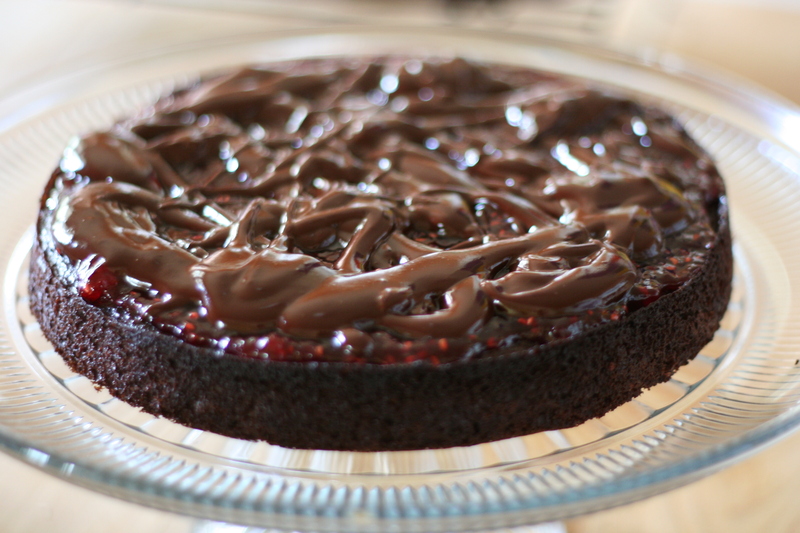 Carefully spread the chocolate frosting over the top, then ice the sides. I like to put a circle of fresh raspberries around the circumference of the top. If you happen to have a decorating bag and tips around, you can alternate a rosebud or star flourish with a raspberry, and a few raspberries in the center will finish it off. Makes 12 servings. ***Make 1 1/2 times the recipe above if you want to make a three-layer cake as I did. Is anyone getting sick of me posting about chocolate and peanut butter combinations? I know I’ve gone a little overboard at times, but they really are my favorite flavors and when combined, totally hit the spot. And can I help it if they also happen to be the favorite flavors of some of my favorite people, too? On Wednesday, my brother came home from nearly two years abroad, and we had a welcome home dinner party for him – he happens to love chocolate and peanut butter, and so did many of our guests (does anyone remember the decadence of Zoe’s birthday cake?). I had been eyeing this recipe from Isa’s Vegan Cookies Invade Your Cookie Jar, and I knew this was the perfect opportunity to make the Chocolate Peanut Butter Pillows. The benefit of making these cookies when you’re about to have a dinner party is you can make them at the last minute, and it becomes a good activity for early-arrivals – you need lots of hands to roll all the little balls of peanut butter batter and cover them in dark chocolate cookie dough. Luckily, I have lovely friends who are happy to help out (and happy to do a lot of tasting along the way!). Make a double batch, and you’ll have enough for the party, the days following, enough to send as a birthday present to a friend out of town, enough for the friend doing the out-of-state delivery, and enough to give as little gifts to special people in your life. There is no end to these cookies…except, sadly, after giving them all away and watching them disappear as your little brother/garbage disposal consumes them in handfuls. Cute. Right now, I’m student teaching in a third grade class, and the students were so thrilled about the holiday – their excitement was contageous! My Cooperating Teacher has really set up a lovely community in the classroom, where the students feel comfortable with each other and with her; the Principal even commented on Friday that the class is just like a family, where there is trust and love and safety – and where the students are so close that they want to celebrate holidays exorbitantly together! These eight and nine year olds didn’t just bring in store-bought cards for their friends for Valentine’s Day, in fact, many of them brought goody bags filled with candy and chocolate and sweet notes for every single student in the whole class! One of our tables was literally covered, piled high with pink boxes of chocolate and red-wrapped chocolate roses, and one student even gave me a foot-long Valentine’s pen! It’s pretty incredible and I plan on treasuring it for a long time. It was hard to get any academic work done on such a celebratory day! My students inspired me and I stayed up way too late on Thursday night making them all collaged cards and I had so much fun that I ended up making cards for all my friends…And then on Friday evening I had a crafts night with my girlfriends and made more V-day cards…And Saturday I spent the evening baking these delicious Banana Blueberry Muffins with my friend Talia and of course I had to put them in the festive paper liners that my mom bought me as a surprise! Aren’t they cute? Thanks, Mom! 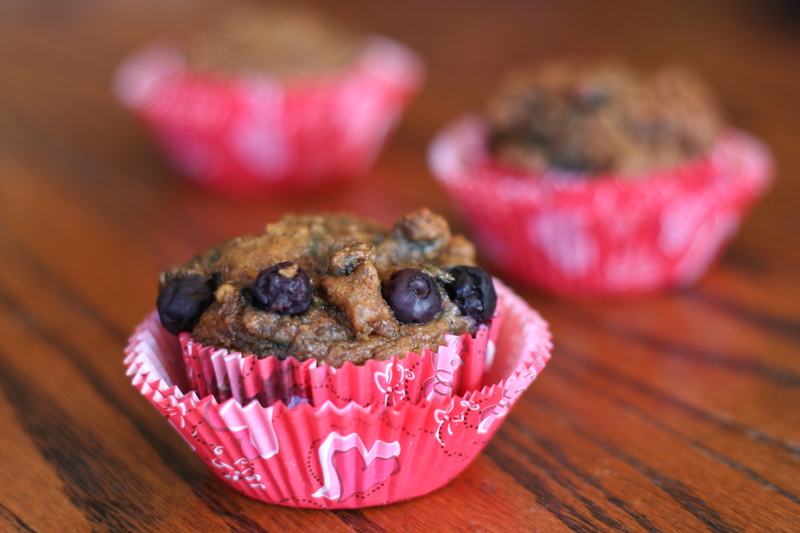 Talia and I are not eating sugar, and she’s currently not eating wheat, so we did a lot of experimenting and adapting, and came up with this muffin recipe using spelt flour and date sugar. We were really into how delicious the batter was, and then how tasty the muffins were after they were baked, but we were a little concerned that they might not pass the test for “normal people” who eat white flour and white sugar all the time. We asked some friends to taste them, and they said they were good! 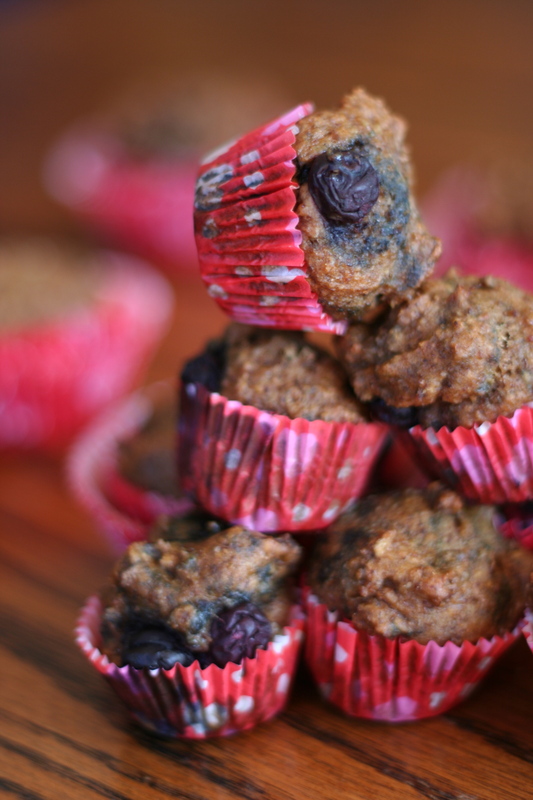 So, this recipe is a great “heart healthy” (for Valentine’s Day as well as your real beating human heart) breakfast muffin, and with all the healthy additions it is certainly a great snack and was approved by all! However, if you don’t have those specialized ingredients on hand, and don’t have the same dietary concerns, then you can easily use white sugar instead of date sugar, and use white (or whole wheat) flour instead of the spelt. You could even make this recipe into a quick-bread, which would be delicious, and you can add in nuts or chocolate chips if you want! Lightly grease your muffin tins, or line with paper liners. In a medium-sized bowl, mix the flour, baking soda, baking powder, and salt together. In a large bowl, beat the date sugar and oil together, then add the mashed bananas. Stir in the flax. Add the water, non-dairy milk, and vanilla, and mix thoroughly. Add the flour mixture and stir until all ingredients are just combined. Gently fold in your blueberries last. Fill each muffin tin 3/4 full with batter. Bake regular sized muffins for 20-25 minutes, and mini-muffins only about 15 minutes. You’ll know they’re done when they begin to brown on top and a toothpick inserted into the center comes out clean. Becky’s birthday party on Saturday was themed Hot Pink/1920’s so I had to come up with something to help me with my lack of costume (I don’t own any hot pink clothes! How is this possible? I’m shocked at myself). 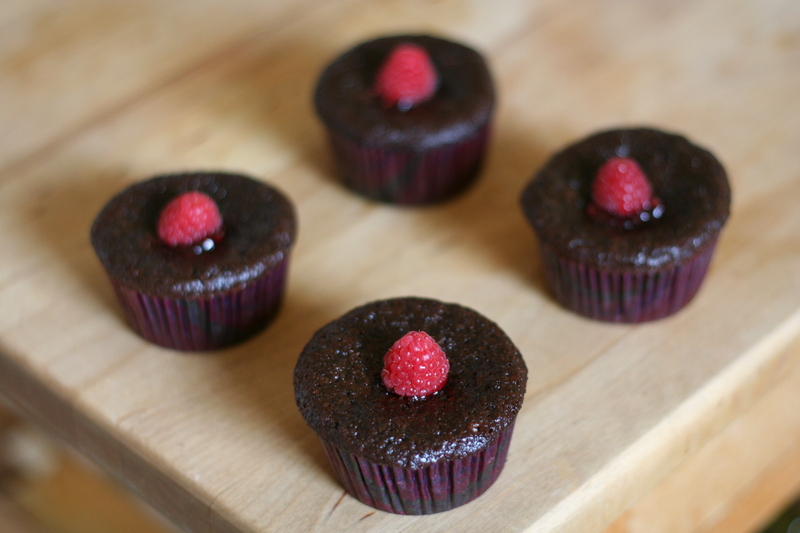 I figured that everyone would forgive me for not dressing up if I had a batch of delicious vegan cupcakes in tow, and so when I woke up in the wee hours of the morning I whipped some up. Inspired by these gorgeous cupcakes, I adapted Lindsay’s recipe only slightly by adding a teaspoon of almond extract to the cake batter and another teaspoon to the frosting (making them a little more like these cupcakes). I also added about a teaspoon of Raspberry Jam piped into the center of each cupcake to give it a little more pink and a little more flair. To do this step, wait till your cupcakes are completely cooled, and then fill a pastry bag with the Raspberry Jam (or other filling). 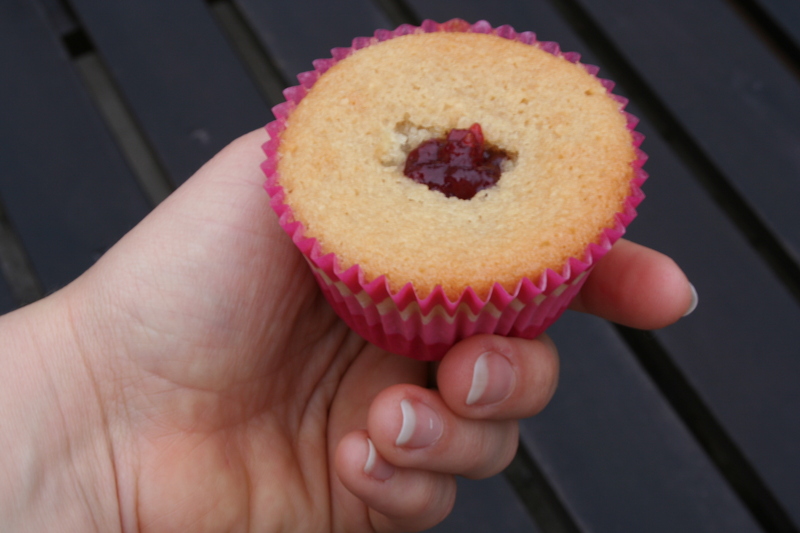 Use a round tip to pipe a small amount of the filling into the center of each cupcake. 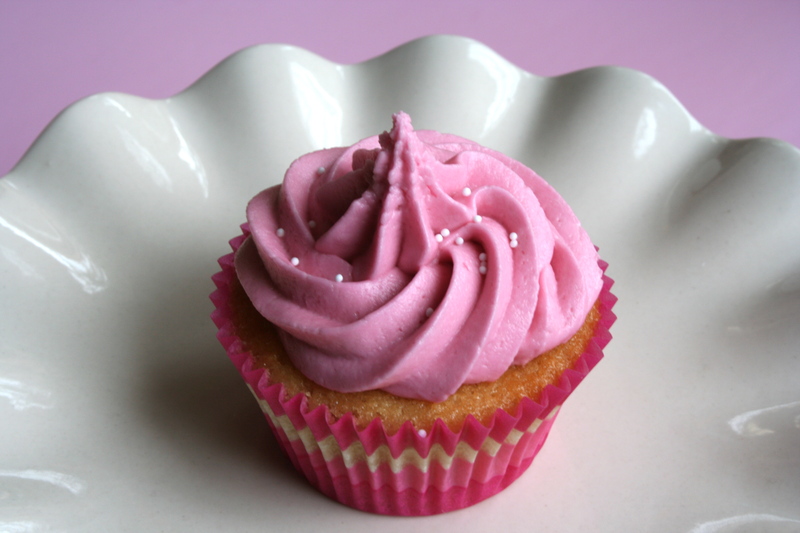 Use a spoon to smooth the filling down into the cupcake, if necessary. Once the cupcakes are filled, fill another pastry bag with the Almond Icing, fitting the bag with a large star tip. Pipe the icing onto the tops of the cupcakes, concealing the Raspberry filling. 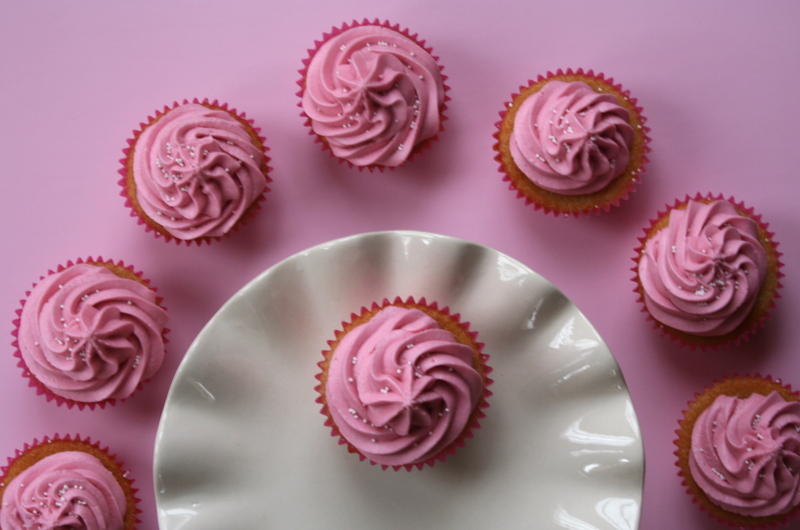 I did learn a valuable lesson in patience while baking these rosy pink cakes. 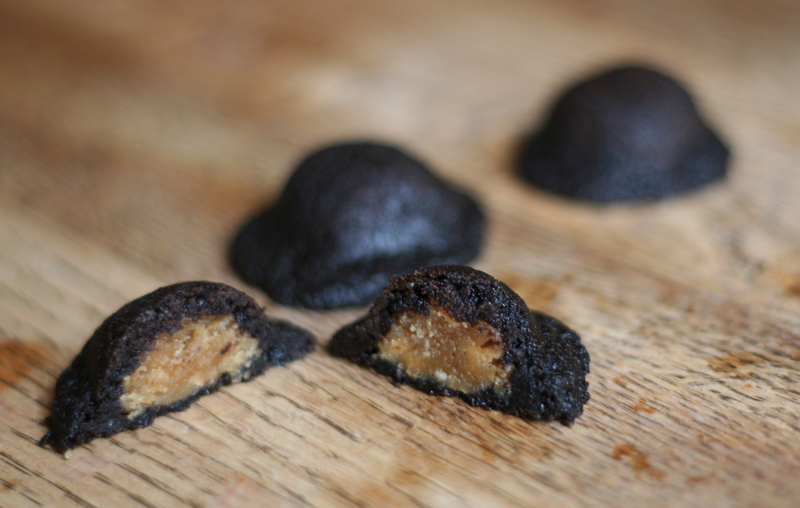 When I took them out of the oven, I immediately unwrapped one and tried to take a bite – However, this is when I thought disaster had struck! The cupcake was stuck to the wrapper. I’m not talking about a little bit of crumb sticking to the paper, I’m talking full-blown cupcake-attachment. The cupcake itself split in half, chewy middle crumbling about while the sides were glued to the pink paper liner. It was impossible to eat, extremely messy, and I was truly upset about this. I couldn’t understand what I had done wrong (I followed the recipe exactly, except for adding almond extract, and I baked them at the right temperature, and I trust Lindsay’s recipes). I was sad about it, but I decided to let these cupcake babies cool and I would frost them anyway; I didn’t have time to bake a whole new batch for the party the same night. After filling and frosting, the cupcakes looked really nice, but I was hesitant about how they would be when people tried to eat them. I brought them to Becky’s house, worried I was going to cover all her guests and their fabulous 1920’s/Hot Pink attire in frosting and cupcake messes. However, when they began consuming the cupcakes, the wrappers peeled off perfectly! I was so relieved. After a little internet-research, I’m realizing this was a silly mistake and I should have known better about it. I’m trying to excuse myself from this freak-out and tell myself I was simply acting so hasty because I was tired (I had woken up at 6am after staying up late the night before…) but really I think I was just rushing around too much and being quite impatient to try the cupcakes! They smelled so good coming out of the oven! So, here’s a new lesson to remember: Let cupcakes cool (at least partially) after taking them out of the oven before unwrapping them. This will give them time to settle and solidify in their final baked state, and they will come out of their wrappers much more easily. And, this rule can apply to other parts of life besides baking: Just a little patience will do you a lot of good! 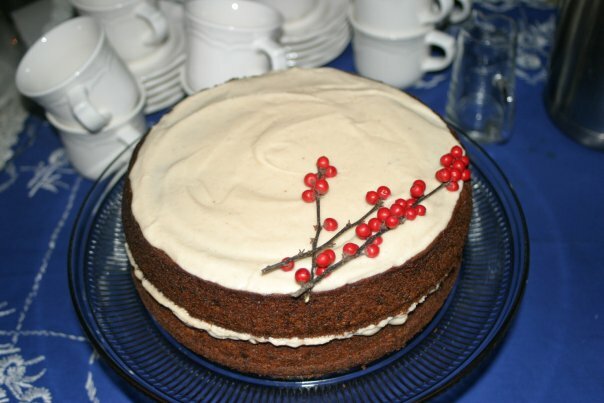 A friend took this photo of the Persimmon Cake I made for Christmas Eve Dinner, and I just got a hold of it*. I realized this picture showed the cake better than I was able to portray it, and I wanted to post it up here for you all to see! Here it is, waiting to be eaten on the drinks and dessert table, while we were all eating the delicious feast that was served first. If you want to see the recipe and the original pictures that I took, you can access that post easily here. 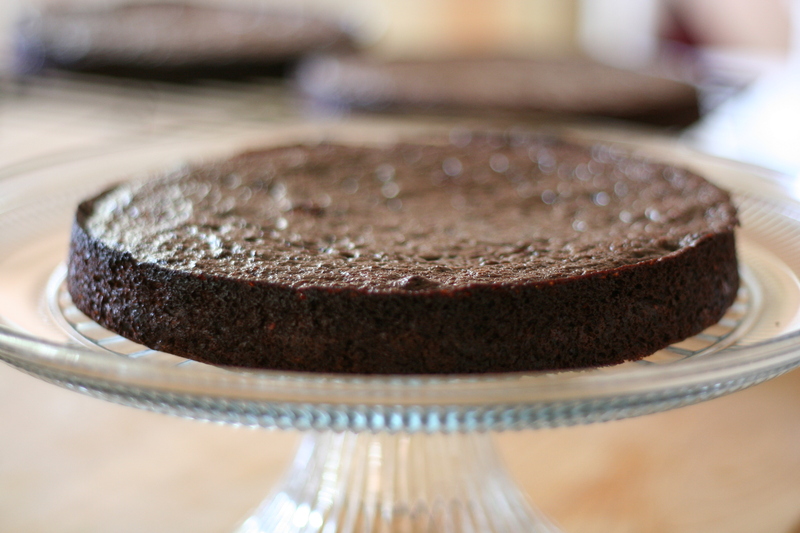 It is a cake that is definitely not to be missed, as it was deliciously spicey, moist with a perfect crumb, and could be served for nearly any occasion, year round! *Picture taken by Nova Tanaya Ray. Thank you!